ATLANTA—(FinalCall.com) The Honorable Minister Louis Farrakhan met with hip hop and entertainment leaders including Rick Ross, 2 Chainz, Jermaine Dupri, Kelly Price, Ron DeVoe, Killer Mike, Benzino, David Mays and others at The Gathering Spot in Atlanta. The Minister delivered the Oct. 13 message with guidance for personal growth and development, dealing with the music industry, resolving beefs, unity and how to use the awesome power of their gifts to uplift the Black community and influence the world. Min. 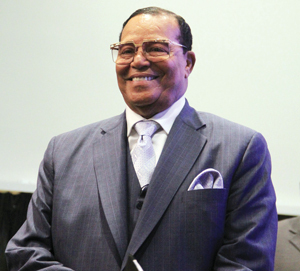 Farrakhan called for a 2016 boycott of holiday spending asking “aren’t you hurting as your people are hurting? If our lives don’t matter, our dollars should not matter either, he said. What if we took 10 percent of the $1.1 trillion in Black spending power and reinvested it in the Black community?” he asked. We never sit down together as millionaires and a few billionaires and plot a future for our people, he said. We could buy millions of acres of farmland and grow healthy food for our people and go into other businesses that would help provide jobs and sustain our community, said Min Farrakhan. There is fertile land in the Mississippi Delta, he noted. Use your gifts to spark a cultural revolution and lead young people into a better world, the Minister added. He urged Black women to embrace their full beauty and not be reduced to their body parts. You are the most beautiful women in the world, said Min. Farrakhan. We are the giants with our gifts in the world of sport and play, he said. The message was positively received by artists and entertainers that were in the audience. Platinum selling rapper Rick Ross said Min. Farrakhan speaks with so much confidence every time he speaks with and seeks counsel from the Muslim leader. “You could be a young Black boy who grew up without a father and not know what that role is and not know what the position is supposed to look like, but he most definitely gives me that experience. When you walk into a room and you see the Minister seated and his words still command that attention, is still giving you that energy and synergy while he’s seated, speaks volumes. The President can’t do that,” said Rick Ross. The home he purchased that was formally boxing champion Evander Holyfield’s estate was a decision Rick Ross said he made after having a discussion with the Minister because he was questioning himself as to whether he should buy it. “He (Min. Farrakhan) said, ‘That’s land brother. I would never second guess land and the investment in land’. I did it and it was one of the best investments thus far. My admiration and my respect for the Minister goes beyond these words that I’ve shared these last few seconds,” Rick Ross told The Final Call. “That’s like God calling me to get that divine instruction. What I’m pulling from it is my next set of instructions. I’m not Professor Griff on my own. I wouldn’t be Professor Griff, there wouldn’t be a Public Enemy if it wasn’t for the Minister. I’m being real. I was in Mosque No. 7 in the ranks, being a regular F.O.I. soldier with The Final Calls. That was my instructions,” he said.